I began experimenting with methods of book binding. Below shows the processes involved in each method. I bought the book "Bookbinding: A step by step guide" by Kathy Abbott which really helped with the processes reassuring me of what I was doing whilst being able to bind accurately using different methods. 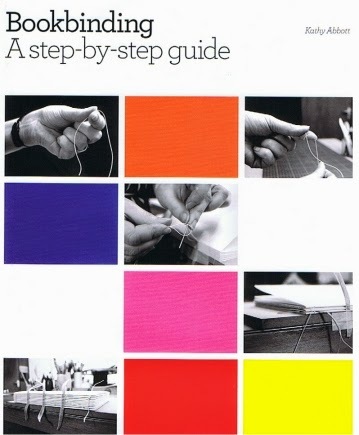 I would really recommend this book to anyone wanting to develop their book binding skills. I do not need to practice methods such as hard back binding at this moment in time, however I feel confident this book will also help in other briefs where this process will be practiced and used. Above: Scan of book cover. I began with the saddle stitch, being the one I am competent with and have used on many occasions before. I organised a series of coloured waxed threads (they are waxed in order to help the paper not ripping), a special book binding hole puncher, a book binding needle, and 12 A5 pages of 90gsm white stock folded in half to A5 portrait format. (The photograph is landscape). I marked dots on each side of the book, 1cm in from the edge of the page, with a 2cm gap. The dots mark where the holes will be punched. The holes have been punched (above) and below shows the stitched book, with black thread down the left hand side (top and bottom). The inside of the notebook revealing the saddle stitch. Writing Pages (above and below). Below shows another mock-up of a saddle stitched notebook with an off cut of the screen printed patterns. This gives a better idea of the overall aesthetic, functionality and use. You can see here when the notebook pressed flat, the inner pages are 0.5cm wider than the cover, and will need trimming down to just inside the cover for professionality and overall finish.